As the trial of the man accused of an arson attack on the Majestik nightclub building in Leeds continues this week, we look at the risk of arson, and indeed any other kind of fire incident, that businesses face and what you can do to protect yours. The consequences of a fire can be wide reaching. In the case of the Majestik, the building itself was empty and had been for several years. However, the hotel adjacent to the building was not and had to be evacuated so it could potentially have been a very serious situation for them. Because of the location of the building in central Leeds, very close to the train station, much of the city centre was locked down for hours; causing massive disruption. The building also sustained massive damage to its roof. As it’s a listed building the cost of renovation will be substantial. It could all have been much worse of course if the building had been occupied. Loss of life is the worst case scenario but even without that, many businesses have folded because of a fire. Insurance payments can take a long time to come through and a lack of contingency planning can put a sudden halt to trading. 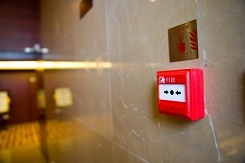 All business premises need some kind of fire alarm system. The exact type will depend on the size, the layout, the nature of your business, how many people work there and the potential risk. You have an obligation for the alarm to be fit for purpose and to be properly maintained. Failing to meet your obligations on fire safety could not only put lives and property at danger but could also constitute a criminal offence and invalidate your insurance cover. For further advice call us on 0800 612 9799 (from a landline) or 0345 833 5543 (from a mobile).